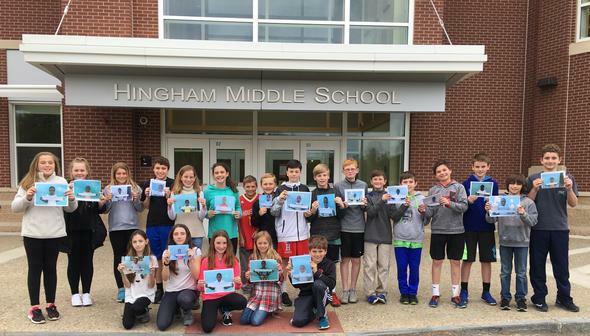 Support Hingham Middle School’s Pen Pal Program in Uganda | Crowdfund Great Experiences & Activities in Your Community! This campaign receives all funds raised. Any funds raised above the goal will make it even better! “Sponsor One Student for One Term” ~ Your support will cover tuition, meals, and a uniform for one term for one of our Pen Pals at Kishunju School in Uganda. Awesome. Thank You! 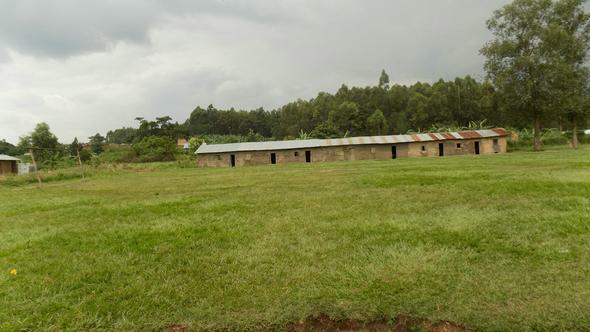 “Sponsor One Student for Two Terms” ~ Your support will cover tuition, meals, and a uniform for two terms for one of our Pen Pals at Kishunju School in Uganda. Awesome. Thank You! 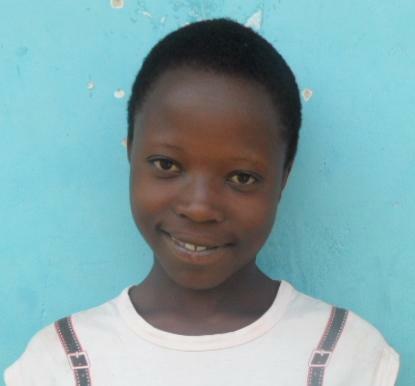 “Sponsor One Student for a Full Year” ~ Your support will cover tuition, meals, and a uniform for one year for one of our Pen Pals at Kishunju School in Uganda. Life-changing. Thank You! “Sponsor Two Students for a Full Year” ~ Your support will cover tuition, meals, and uniforms for one year for two of our Pen Pals at Kishunju School in Uganda. Life-changing. Thank You! “Sponsor Three Students for a Full Year” ~ Your support will cover tuition, meals, and uniforms for one year for three of our Pen Pals at Kishunju School in Uganda. Life-changing. Thank You! “Sponsor Four Students for a Full Year” ~ Your support will cover tuition, meals, and uniforms for one year for four of our Pen Pals at Kishunju School in Uganda. Life-changing. Thank You! “Sponsor Five Students for a Full Year” ~ Your support will cover tuition, meals, and uniforms for one year for five of our Pen Pals at Kishunju School in Uganda. Life-changing. Thank You! 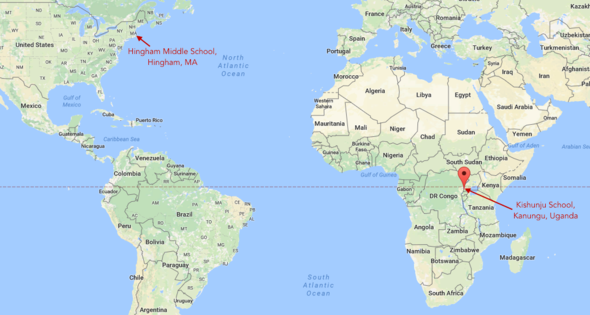 The Hingham Middle School (HMS) recently developed a Pen Pal Program with students at the Kishunju School in Uganda, Africa. If you'd like to support this effort, you can click here to make a donation! Through this relationship, HMS students are connecting with and learning from students living in a country and a community that is very different from theirs. They are learning that education is a gift that many children in the world do not have access to. HMS students are learning how fortunate they are to have access to healthy food and clean water, and to live in a community that is safe and that supports their education and development. 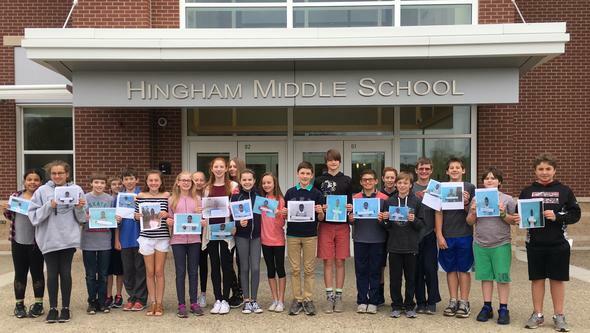 Many of Hingham Middle School’s pen pals at the Kishunju School in Uganda are not this fortunate. Through our Pen Pal Program, we have learned that many children drop-out of school due to hunger or insufficient funds to pay for their tuition fees. This is a serious problem because the children who receive an education and attend Kishunju School have better outcomes and bring hope and positive change to their community and their families. The children who drop out of school typically struggle and are at-risk for factors that can hurt them, their families, and their community. Education has the power to positively transform our Pen Pals lives and we can help to make that happen! Many of our Pen Pals have dropped out of school because they cannot afford $50 per year for tuition or $25 per year for meals at School… This has been eye opening for all of us, and we want to help! The purpose of this fundraiser is to support our Pen Pals, and to help the kids at Kishunju School receive a great education just like us! Our Pen Pals at Kishunju School in Uganda, Africa! Our Pen Pals at Kishunju School eating breakfast porridge together. School meals cost $25 per year per student. Many students at Kishunju School cannot afford this, so they go hungry at school and ultimately drop out. We want to help! Our Pen Pals carry water daily from a local well to support their families. This well is the only source of fresh, clean water for drinking and bathing in their village. 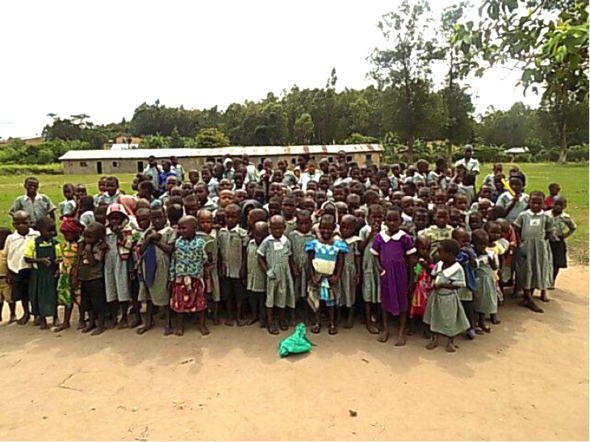 This is Kishunju School in Kanungu, Uganda where our Pen Pals go to school! Where is Kishunju School? It is located in Kanungu, Uganda (Africa), a remote village with a population of approx. 700. You can explore it here on Google Maps. What kind of community is Kishunju School in? Kanungu is in a remote and impoverished area of Uganda. Most people in the community are illiterate. There is no electricity in the school or in the village. Kanungu does not have running water. There is a single community well that people walk to in order to collect water for drinking and cleaning. Most people do not own shoes and food can be scarce. It’s a hard life compared to our life here in the United States, but family bonds are strong in Kanungu, and there a strong sense of community and culture that binds people together and provides a support network despite daily struggles. How did HMS initially get involved with Kishunju School? After HMS teacher, Mrs. Caroline Farris, read the book I Will Always Write Back: How One Letter Changed Two Lives, she wanted to find pen pals in Africa for her students. She contacted African embassies, the Peace Corps, nonprofits, as well as schools throughout Africa and had no luck. Finally, after seven months of reaching out to organizations and people throughout Africa, she connected with someone interested in forging a pen pal relationship with HMS: Denise Duffy, the aunt of one of Mrs. Farris’s student’s, Kevin Gay, travels frequently to Kanungu, Uganda to study gorillas in nearby Bwindi. Denise connected Mrs. Farris with her friend Herbert Niwigaba, a teacher at Kishunju School, who was interested in having his students correspond with students at Hingham Middle School. Now, three of Mrs. Farris’s five sections of English class are writing to students at Kishunju School. Regular mail is unreliable and slow, so families from Mrs. Farris’s team of students donated money for a printer/scanner so the Pen Pal Program can work! Mrs. Farris emails letters from her students to Kishunju School, and the letters are printed out and delivered to the students. The students at Kishunju School in turn write letters and they are scanned and emailed back to HMS. Herbert Niwigaba of Kishunju School was central to getting this started. Sadly, Herbert was tragically and recently killed in a car accident. This has been devastating for his wife and five children, the village, and Kishunju School. Herbert was not only HMS’s pen pal contact, but also the founder of Opportunity Africa, an Ugandan NGO working in Kanungu to vitalize the community. Herbert was also a teacher, counselor, and social worker who worked tirelessly to keep children in school. His loss is felt thousands of miles away here in Hingham. Fortunately, Herbert’s brother, also a teacher at Kishunju School, has agreed to take over the Pen Pal Program along with the school’s headmaster, Job Nahabwe, and we will be working with both Nathan and Job, to continue to develop and grow the program for our students. How much does it cost for one student to go to Kishunju School for one year? It costs $79 per year. This covers tuition ($50), school meals ($25), and a uniform ($4) for one year. How will the money raised from this fundraiser be used? It will be used to pay for children in Kanungu, Uganda who cannot afford school and for our pen pals who have had to dropout of school. Our ultimate goal is to have local Hingham families sponsor a child’s education. The money will be sent directly to Kishunju School and deposited into the School’s account. 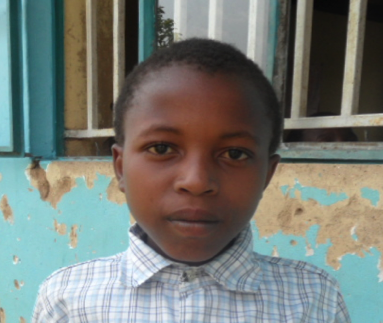 If families would like to sponsor a specific child we can relay that to the Headmaster of Kishunju School. What impact will this have on the kids in Uganda? It will be life changing. Why is it important for HMS students to participate in this Program? Students at HMS are learning that the world is a big place. They are connecting with students across the globe and are learning about a way of life that is very different from theirs. Students at HMS are also learning that education is a gift that many children do not have access to. They are learning that education is a way to promote positive change and a way out of poverty and challenging life circumstances. Students are also learning the value of a dollar. Students have been shocked to learn that just $25 will pay for meals for an entire year at Kishunju School, and that many families cannot afford this. They have had serious conversations about how one seltzer water in the HMS cafeteria costs $1.75 a bottle and their pen pals in Uganda cannot afford to pay for a $4 uniform to go to school. This has been an eye-opening experience for our students at HMS. How can I help? You can help by making a financial contribution to this fundraising page! 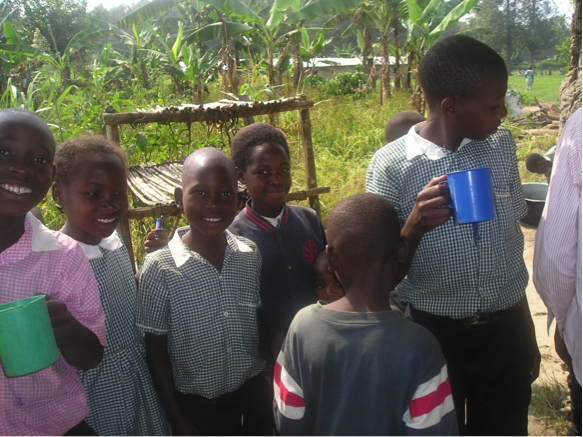 Your support will help to keep our Pen Pal Program going and it will help to change lives here in Hingham and in Uganda. Thank You! Thanks to your support we can keep our Pen Pal Program going, and we can help our Pen Pals like Allan, Akampurira and many more with their education. We appreciate your support! 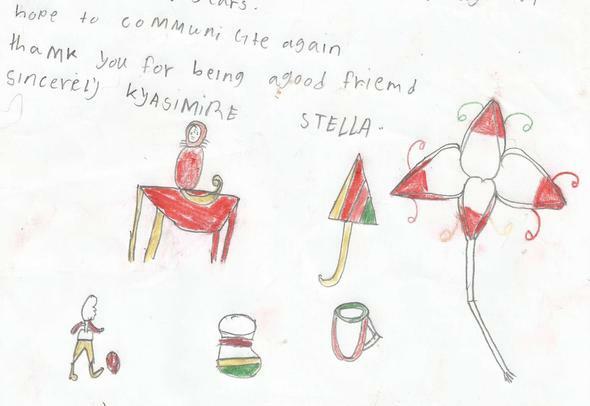 Part of a letter from one of our Pen Pals at Kishunju School! Education is for improving the lives of others and for leaving your community and world better than you found it. In some parts of the world, students are going to school every day. It's their normal life. But in other parts of the world, we are starving for education... it's like a precious gift. It's like a diamond. Let us pick up our books and our pens,” I said. “They are our most powerful weapons. One child, one teacher, one book, and one pen can change the world. I you'd like to help, you can click here to make a donation!